Actions from the Skipper Cup match between Namosi and Northland at Thompson park yesterday.Photo:Vilimoni Vaganalau. Defending Skipper Cup champions BLK Nadroga rugby team will have to beat Northland on Saturday if they are to confirm their semifinal spot. 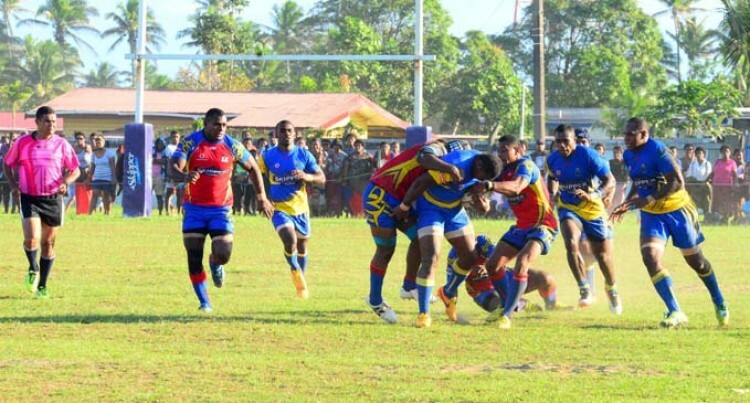 Heading into the final round of competition, the Sekonaia Kalou- captained side travel to Gatward Park in Korovou with the mission to put their title defence on track. This was after a Fiji Rugby Union press statement yesterday confirmed that the Suva rugby team have won their protest over Nadroga, for not properly registering a player. The protest was lodged to the Games Committee and was forwarded to a judiciary officer (in this case a magistrate) who deliberated on the matter. “The points table for the senior competition has been adjusted to accommodate the ruling of the judiciary officer in relation to the outcome of the match between Suva and Nadroga,” stated the press release. But after their convincing win over Malolo last Friday, Nadroga rugby team manager Apakuki Tuitavua said as defending champions they are not going to give in easily. “We will play each match as a final,” he told SUNSports. Suva now head the points table with 40 points followed by Nadroga and Naitasiri with 36 while Northland and Namosi are at 33. Not to be counter out are Nadi and Malolo as they have 31. Suva coach Akuila Nasi said they are going into the last round with the aim to host one of the Skipper Cup semifinals. Naitasiri coach Reverend Jioji Rinakama said after their 14-9 win over Macuata in Labasa that they are going for a semifinal spot. In another cracker sees Namosi take on Malolo and pending on the outcome of all matches, they both stand a chance of qualifying for the semi-finals as well. Also another interesting battle looms between Vatukoula and Macuata as they fight for a top eight spot. The gold miners have an upper hand as they recorded their second win last Saturday but they are on equal 14 points with Macuata. The Northerners travel to Garvey Park to take on Tavua while Vatukoula will try to do the impossible and that is to score an upset win over Suva.